Infants are very susceptible to tooth decay, which is why getting them to their dentist once their teeth erupt or by their first birthday is so important. In fact, the Centers for Disease Control and Prevention has reported that 40 percent of children will experience a dental cavity by the time they reach kindergarten. Furthermore, the rates of tooth decay in children’s baby teeth is on the rise according to recent studies on the subject. Keep in mind this is in accordance with the American Academy of Pediatric Dentistry and the American Academy of Pediatrics. Even if no teeth have erupted by the age of one, you should still bring them in. The sooner you bring them, the earlier your dentist can begin preventive care, which is proven to be the most effective solution to catching and treating issues before they become major. General dentists are more inclined to see patients of all ages, but pediatric dentists must complete additional years of special training to specifically cater to children. As a result, they structure every aspect of the office, from the staff to the design, to better accommodate infants, toddlers, and preschoolers, along with their older counterparts. For example, if a child is tearful or fussy, a pediatric dentist is more prepared to meet their needs. Furthermore, pediatric dentists are more involved at every unique milestone of your child’s oral development. From the first baby tooth erupting to their final permanent tooth, you can expect care that caters specifically to these milestones. 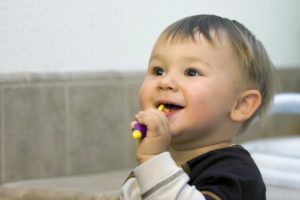 In addition, pediatric dentists know how to solve problems that are unique to your child’s age, including thumb-sucking, which can negatively affect their oral development. Handling this sooner can reduce the amount of treatment needed in the long-term. The first visit is mainly intended to prevent dental issues before they become problems, as well as help parents learn the right dental care tips for your child’s teeth. During the visit, we’ll examine their teeth, perform a cleaning, and apply a fluoride treatment. However, most of the visit is spent talking to parents about proper oral care habits at home. Since the bulk of dental disease prevention is performed at home, establishing this dialogue first is more essential than any other aspect for protecting your child’s mouth. Ready to learn more habits that prepare your child for a lifetime of healthy smiles? Schedule an appointment with your dentist today! Dr. Mira Albert is a board-certified pediatric dentist and Diplomate of the American Board of Pediatric Dentistry, a fellow and national spokesperson of the American Academy of Pediatric Dentistry. As a mother and pediatric dentist, her goal is to help parents establish a dental home for kids, ensuring that their mouth is protected and that parents know the right steps in at-home care. To learn more about her practice, contact her through her website.